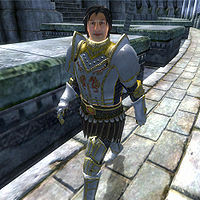 Carmalo Truiand is an Imperial Watch Captain in the Imperial City. His room is the Captain's Quarters in the Northeast Watch Tower. He is the replacement for Audens Avidius in the quest Imperial Corruption. The list of candidates for the new Captain of the Guard in Anvil during the quest Taking Care of Lex describes Carmalo as "smart but inexperienced" and a good second choice for the job (second to Itius Hayn). Carmalo will appear on the list whether he has replaced Audens or not. Carmalo does not exist in the game prior to his replacement of Avidius. Once he takes over command of the Northeast Watch Tower, he inherits his predecessor's schedule nearly entirely. He sleeps in his room in the Northeast Watch Tower from 10pm every night until 6am, when he begins his day by eating breakfast, still in his room. At 8am he heads out to begin his morning watch of the Market District, starting off at the door to the Arena District, and patrolling a counterclockwise path of the area, moving to the exit to the city isle at 9am, then to the gate to the Elven Gardens District at 10am, and finally to the entrance to Green Emperor Way for 11am. At noon he heads to the Feed Bag for lunch, where he spends two hours eating. After this, he goes for his afternoon patrol in the Arena District. Here he starts at the gate to the Market District, moves to behind the Arena at 3pm, and moves to the gate to the Temple District for 4pm. At 5pm he will head back to the Northeast Watch Tower, wandering around the main floor until 6pm, when he heads up to his quarters to eat dinner. At 8pm he goes back downstairs to wander for another two hours until his bedtime at 10pm. As with most other residents of the Imperial City, while martial law is in effect during the quest Light the Dragonfires, Carmalo will return to the Northeast Watch Tower and remain downstairs. Carmalo Truiand wears Imperial Watch boots, cuirass, gauntlets, and greaves. In combat he will use his silver warhammer. He carries a copy of the Imperial Watch key and the NE Watch Tower key. Carmalo carries a small amount of gold. Imperial Corruption: One of the Imperial Guard captains in the Imperial City is corrupt. Carmalo inherited the bug from Audens Avidius that leads to him neglecting to patrol near the western gate of the Arena District from 5pm to 6pm. Instead he returns to the Northeast Watch Tower and wanders the main floor. Esta página foi modificada pela última vez à(s) 03h19min de 2 de abril de 2013.